Those who follow me on Twitter might be aware that I recently started to dip my feet into PvP. I’ve tried it before once or twice, but only now have I started to read guides, work on strategies, and try to gain some valuable experience. Eric Stormbringer, PvP extraordinaire, actually offered to help me out and he’s been an excellent teacher! It’s amazing seeing an experienced duelist do their thing, and even more amazing to be able to learn from such a person. Thanks Eric for being super patient with me! Coming from the derby community, it immediately became apparent that PvP is a very different beast to tame. While derby certainly has its fair share of strategies, there are only so many derby abilities to account for. In PvP, almost any spell is fair game and that can make things extremely … interesting (and scary!). 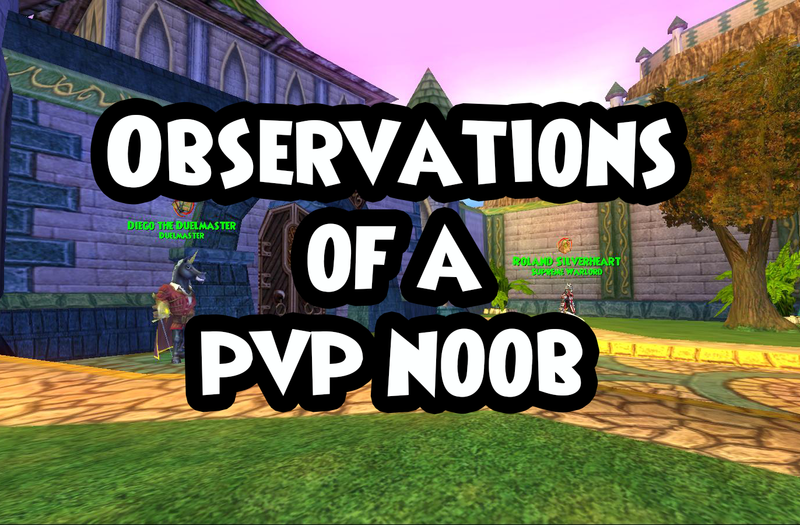 Here are some of my early PvP observations and struggles! My deck is filled to the brim. In PvE, small decks are essential to end battles quickly and swiftly. In PvP, you need a bunch of cards to be prepared for anything you might encounter. It’s much less rigid and organized than PvE, and that is a big adjustment to make for me. The card cycling struggle. Because of all the extra cards in my deck, discarding and card cycling becomes key in PvP. I’m having a lot of trouble with this right now – deciding which cards to get rid of and which to keep. Other players assure me that I’ll get better at this with some more experience … I hope so! Which attacks to use. I have a variety of attacks in my arsenal, but sometimes it’s hard to decide which ones to use and when. Attacking too soon will drain my pips, but attacking too late and I could end up being defeated. Decisions decisions. PvP can surprisingly be expensive. I blow through so many TCs (especially enchants) that I have to constantly rebuy after x number of battles. It’s not that big of a deal because I always have close to max gold, but I never realized how quickly gold can disappear when you really invest yourself. The community is very different. While the derby community is pretty welcoming and always open to striking up a conversation, the PvP community comes across as much more competitive and hostile. This isn’t always true, just a generalization. I admire those who are motivated and practice to be the best, but I just wish some more sportsmanship came along with it. I’m currently a Corporal, so I have a long way to go on my PvP journey. I want to thank everyone who has offered tips and advice, you rock! Exploring previously uncharted terrain has been really exciting for me. I’ll try to keep you guys updated on how I do in the future.